Yes, that is me in front of the American Flag. One of the projects that we have been putting off for far too long is the creation of our first online course. We operate a few niche SaaS sites. One of our niche sites simplifies creating forms required in real estate transactions. 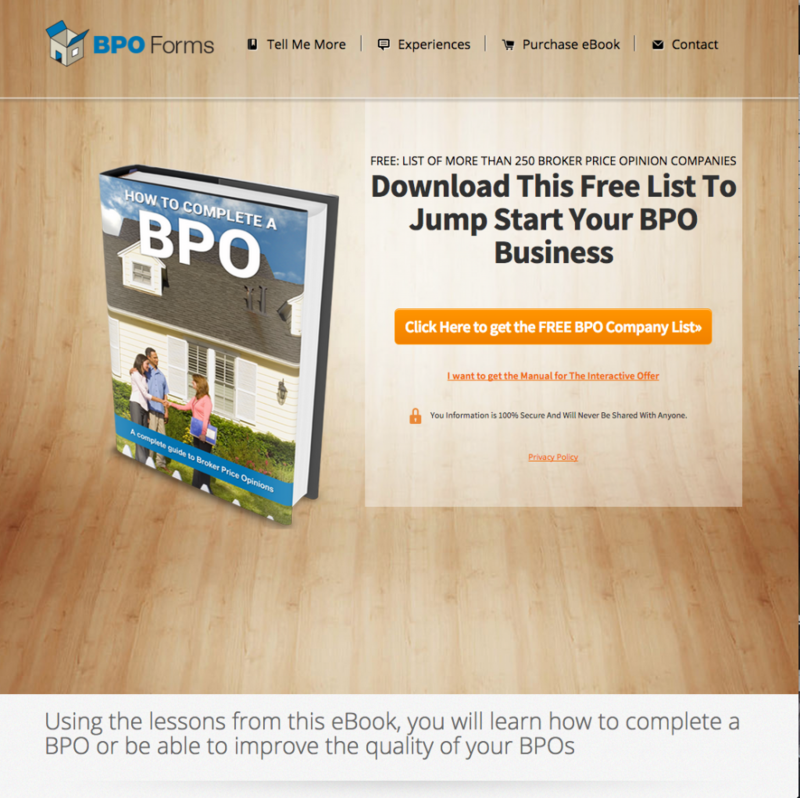 The site is BPO Forms, which is short for Broker Price Opinion Forms. 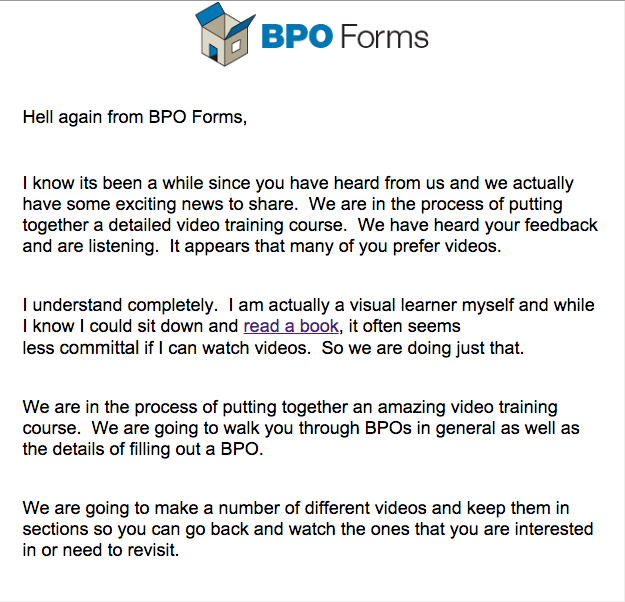 BPO Forms is one of our smaller niche sites, with about 200 monthly subscribers. While the monthly recurring revenue is nothing to write home about, we were getting a bunch support emails looking for training in the field. We wrote a book, How To Complete a BPO, that outlines the process of completing a BPO and is the perfect compliment to the site. When a visitor comes to the site looking for information to help them get started we can sell them our book. In an effort to sell more copies of the book, we created an up sell page and an autoresponder series. We used a list of companies where this individual could potentially complete BPOs for a fee as the opt in magnet. To our surprise our email list grew rather quickly. In under 6 months and with no marketing our list had grown to over 500 subscribers. Our book was performing relatively well, selling a few copies weekly on Amazon as well as directly on our site. What was not performing well was our autoresponder series. Those who chose to buy the book often never signed up for the email series. Those on the email series rarely ended up converting and buying the book. At this point we started to pick up 5 to 6 new email subscribers a day. Even though the autoresponder was not converting into book sales, people were not unsubscribing from the list. List subscribers like what they are reading in the series, but for whatever reason were not compelled to buy the book. We analyzed the numbers and felt like we were clearly underserving our list. Maybe we can re-format the information / knowledge in our book. Instead of building something that no one wanted, like we have done in the past, we tested our assumptions on the list. We sent a broadcast message to our list, which at the time was 650 subscribers. The subject, “Shhh. Its our Secret: BPO Course,” and the message was to the point. To summarize, we asked members of our list to respond, “yes” to the message if they would be interested in our online course. The broadcast message to our list got 200 opens and out of those opens 30 subscribers responded with a yes. This was enough validation for us. Our subscribers even ignored the fact that we misspelled the very first word in the email, opting for “hell” instead of “hello.” We set forward to enter the online education market. Yes, we misspelled the first word. The online education market is on fire. The self paced online education market has gone from $35.6 billion spent in 2013, to $56.2 billion spent in 2014 and that number is expected to double in 2015. What do these huge numbers have to do with us? Nothing. It is always fun to type billion. It is easy to get excited about huge numbers and try to carve out a piece of the pie. The numbers clearly indicate that the market is growing and quickly. However, we know from working in our niche for a long time that the pool of potential buyers is small. We do not expect to make massive revenues from this course. The market is just too small. However, we currently have an audience and we are very clearly underserving them. We have never put together an online course. What better way to cut our chops then to build the course for an audience that we know is interested in what we are selling. Our first step in creating the course was creating an outline based upon the book. Jon quickly outlined the chapters and main points from within the book. He shared a google doc of the outline and I reviewed and added any points that I felt would be helpful. Our thinking is that our audience would be best served by a course that is delivered primarily as video. Our audience is real estate agents and they are not the most technically savvy bunch. Seeing a person on video demonstrate some of the concepts would most likely be the most effective method to help them learn the subject matter. With our outline complete and our focus set on using video to deliver the course we were ready for the next step. What was the next step? We had no idea. We let fear of the unknown take over and we did not take any action for a few weeks. We run a few other business so it is easy to put something that is outside of your comfort zone on the back-burner. 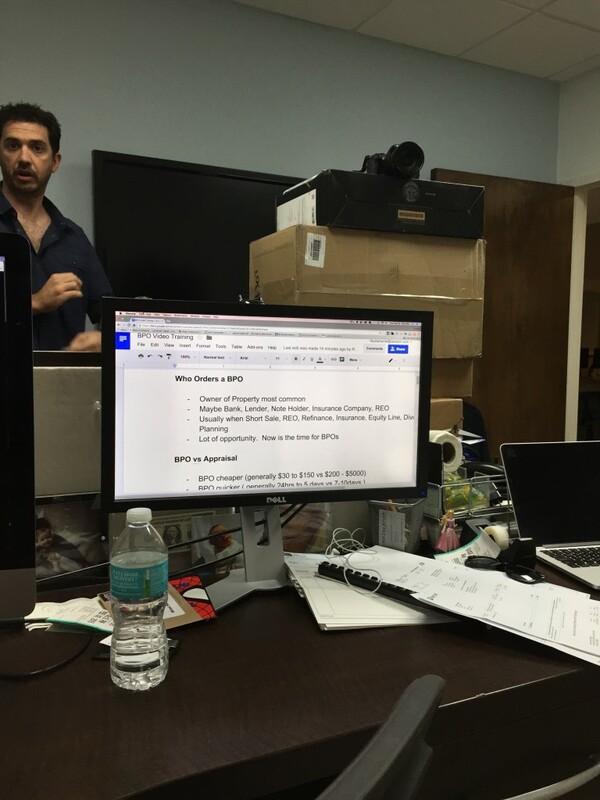 Jon walked into my office one day and said we need to film the course, we need to take action. I agreed and we planned to stay late a few nights during the week to film our first online course. I borrowed camera equipment from a videographer friend and we were ready to start filming the course. For several reasons we decided that I was going to be the face of the video. Meaning yours truly would be on camera teaching the in and outs of our content. Wow was I uncomfortable with the thought of being on video. Again, I was way outside of my comfort zone. Even though I was uncomfortable with the thought of being on video, this is something that I wanted to do. One our our goals with Long Live the Internet is to share the knowledge we have accumulated running our online businesses. Another goal is to grow our audience. Video is going to play a large part in achieving both of those goals, so I might as well get comfortable with it. To say I struggled would be a huge understatement. I know the BPO and real estate industry like the back of my hand. I have been in the business for almost 10 years. Yet I could not get through a few sentences without saying “um” or “again” or looking at the screen that was displaying the outline. I didn’t need the outline, I know the subject matter. To Jon’s credit he was pretty patient and supportive, but he really didn’t have any other option at this point. At one point he suggested turning off the screen with the outline, which helped. If this doesn’t scream professional I don’t know what does. After a few takes and working through the outline I started getting a little looser. I was still uncomfortable, but I was able to elaborate on the subject matter and effectively communicate some difficult concepts. Cumulatively we filmed about 6 hours of footage. We even went on location to film some bonus footage. Unfortunately, now we have to edit 6 hours of footage. We went chronologically though the outline, but there are several takes for each section and sometimes we just weren’t happy with how something turned out so we would re-shoot it. There is no doubt that we have all of the content we need. We just have to wade through hours and hours of video to extract the best portions. When we set out to create our first online course we thought we were going to film a few videos, put the videos behind a paywall and be done with it. However, after we finished filming we were not confident that our videos alone would be good enough to represent our brand properly. Instead of hosting a few videos and calling it a course we decided to build out an entire online course with modules and proper formatting. In an industry that is expected to have over $100 billion spent in 2015 there are plenty of options for course software. There are several hosted options. For example, udemy has an entire platform for course creators. They have 6 million users in their platform and their course building software seems easy to use. If one of their students signs up for your course, you pay them 50% if it is one of your own students you only have to pay the processing fees. Fedora is another hosted solution, but they are better suited for white labeling your course. 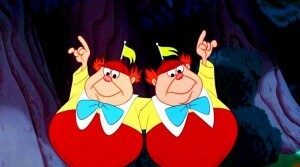 For example, hosting your course at www.mycourse.com and using their software to power the course. You pay them a percentage of any sale and if you opt for an upgraded version of their software you also pay a monthly fee. They do not provide an audience like udemy does, but they also only take a small percentage of any sale. Hosted options do not really make sense for us. Udemy provides an audience, but as previously mentioned, our market is not very large and we feel that we have a captive audience for our course. Fedora does not make sense for us as we have payment processors set up and do not want to add another payment processor to the mix. While we have not committed to any software, we are most likely going to purchase online course software for WordPress. While doing research I stumbled across a few different resources that I would like to share. 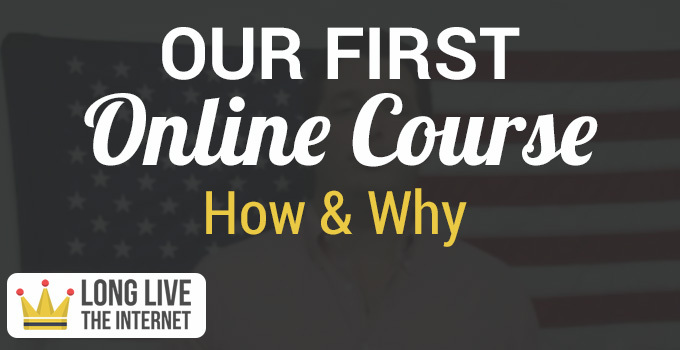 The first is Create Awesome Online Courses by David Siteman Garland. I was introduced to David on Pat Flynn’s podcast. It was a great episode as it was focused on building online courses and I eventually signed up for David’s list and watched a few of his webinars / videos. I haven’t signed up for the course, but the material that he gives away for free is great and I would highly recommend it for anyone that is interested in creating an online course. The second resource is Derek Halpern of social triggers. 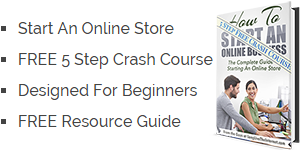 He ran a free seven day course called “How to Create (and Sell) Online Courses.” This was another great free resource. Derek built a WordPress plugin to help create online courses, zippy courses, which we are considering using for our course as well. If I had it to do over again, I might have purchased the software first and started building out the modules. Then recorded the videos and edited them on the spot to fit into the course. This would have saved us a bunch of editing time and we might have been able to release the course quicker. I also would not have delayed filming the course and delayed taking action for so long. When you are thinking about taking on a big project it is easy to look at the entirety of the task and take no action. If I would have committed an hour or even thirty minutes a day to getting the course done I would have finished weeks ago. So now it is time to take action. I will follow up with a post on how we completed the course.